relationships and a reputation. We are an experienced, successful, insured, award-winning construction company dedicated to providing quality work to our clients. 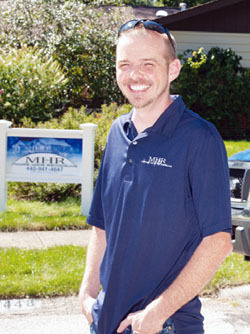 The owner, Brent Moore, has over 15 years of remodeling experience. This experience is paired with a keen desire to help our clients realize their remodeling goals. Because of this, have working preferred partnerships with other outstanding professionals in our industry to be sure every job is done right. Communication: We keep our clients informed throughout the process and we issue progressive invoices. Honesty: We make sure you know your options and the costs involved upfront; You know what we know. Integrity: We tell you about any possible problems we see up front. If something comes up during the job we’ll let you know right away. Many times there are no additional cost to resolve these issues. At Moore Home Remodeling, we believe it is our responsibility to give you information so you can make informed decisions for you and your family. From a simple room makeover with no layout changes to a full redesign & remodel, we can help you. If you need something we can’t do, we may know someone we trust who can.